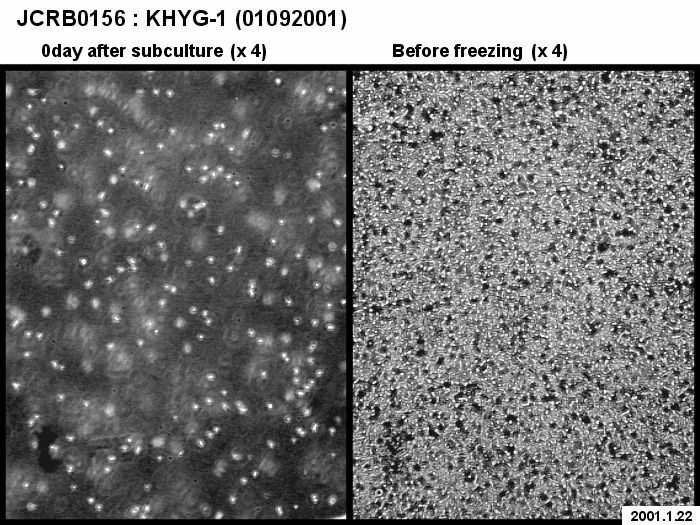 The natural killar-like cell lines are generally weak for freeze-thawing and are sensitive to culture conditions. This is also true for KHYG-1 cell line. 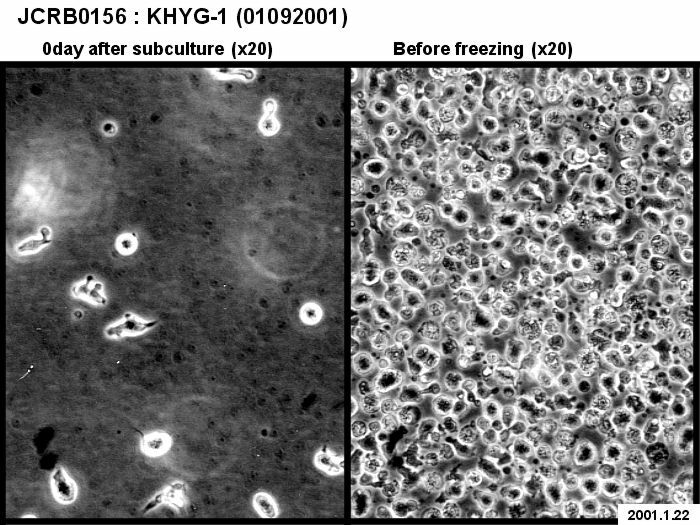 The growth of KHYG-1 tends to depend on high cell density. If the condition of cell line is not improved after thawing, the most simple method will be slant culture. The flask is slanted so as to achieve the local high cell density in the bottom of flask corner. 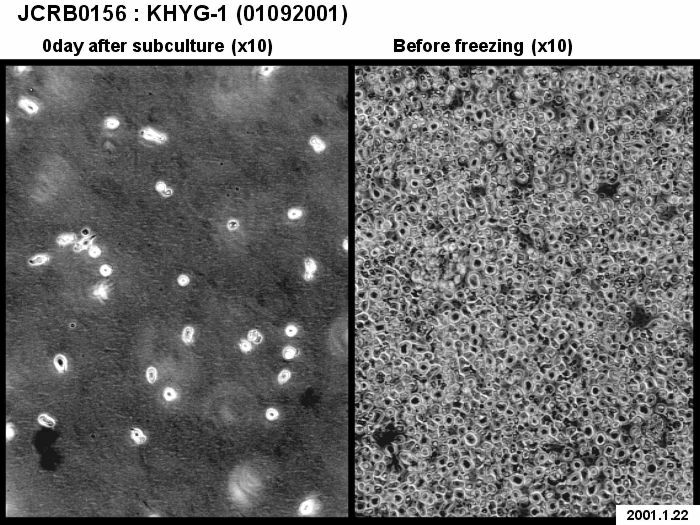 The human haematopoietic cell line is sensitive to culture conditions. The cell line itself secretes the growth factors and survival factors in the culture media. Therefore, excessive dilution or too frequent medium renewal may become rather harmful to cells. Simply add the medium to the old medium with cells. The media color indicated by phenol red should be orange. If the medium color is pink or purple, it is not suitable. The increased concentration of fetal bovine serum (such as 20%) may improve the culture condition. 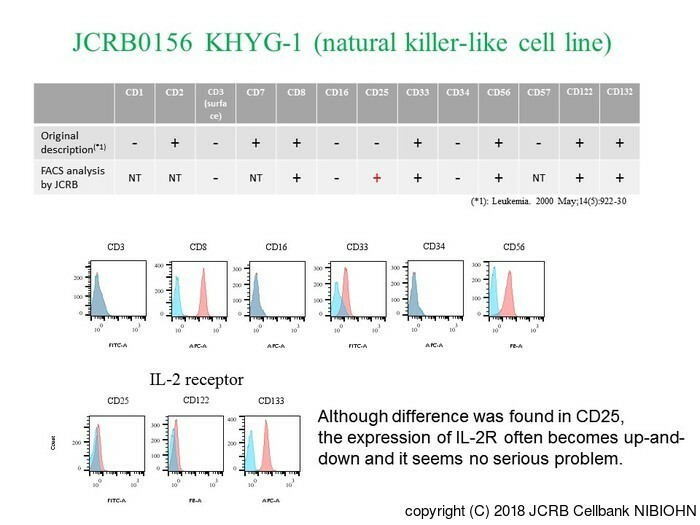 There is difference in CD25 (low affinity IL-2R) expression between the original report of KHYG-1 and the FACS analysis by JCRB Cell Bank. 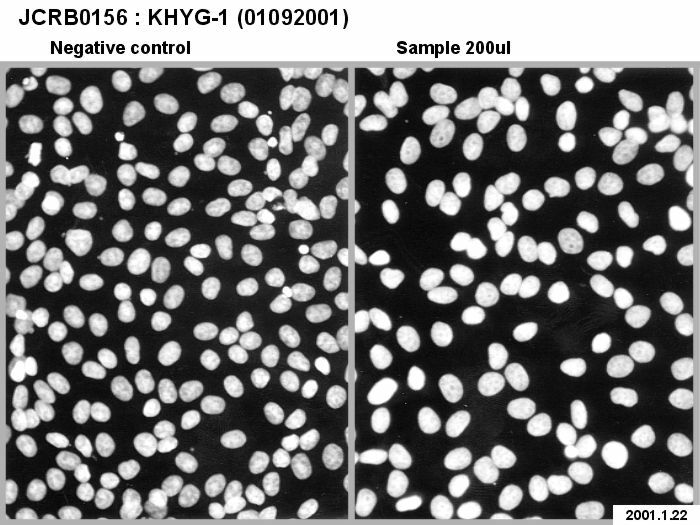 According to the original paper by the developer (Leukemia, 14: 922-930, 2000), the KHYG-1 is described as CD25 negative. 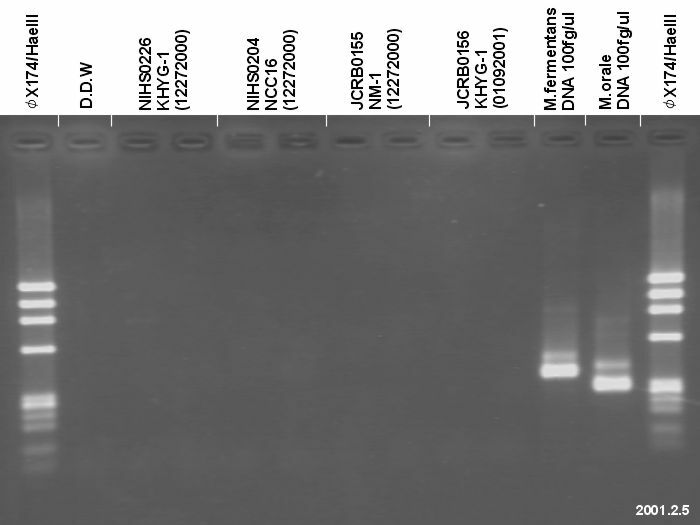 However, JCRB's FACS analysis detected CD25 in KHYG-1. Human natural killer cell line with a p53 point mutation as a model for p53-associated leukemogenesis and a model for differentiation of NK/T cells. high NK/LAK activity, IFN gamma production etc. RPMI1640 medium containing with 10% fetal calf serum and 100 units/ml of rIL-2(Shionogi). Simple dilution because of suspension cell culture. Subculture every 3-4 days with split ratio = 1/4. Split 1/4 every 3-4 days. 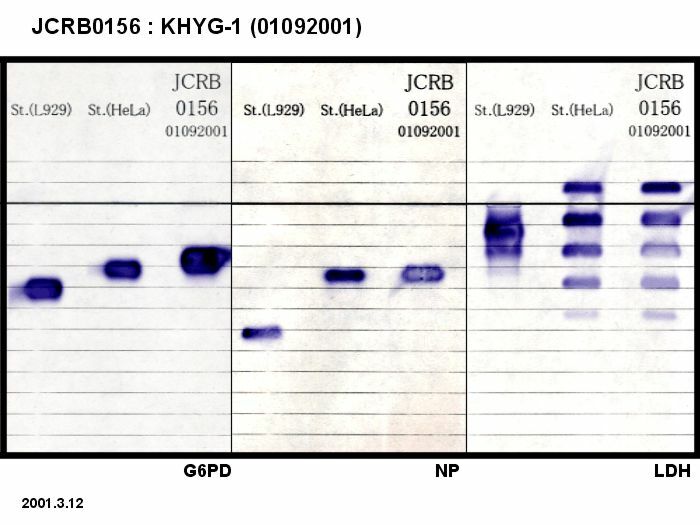 A novel natural killer cell line (KHYG-1) from a patient with aggressive natural killer cell leukemia carrying a p53 point mutation. Simple dilution (suspension culture). Avoid excessive dilution. 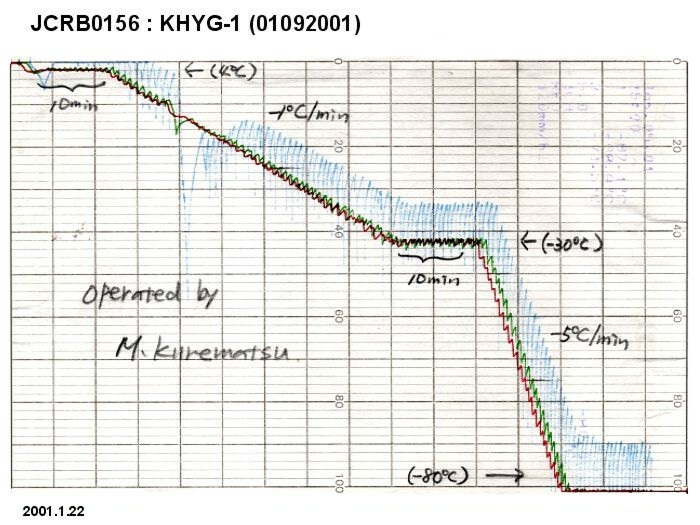 Simple dilution (suspension culture). Subculture every 3-4 days with split ratio = 1/4.